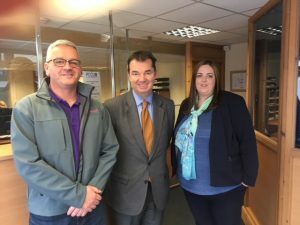 Pennine Community Credit Union had the honour of welcoming MP Guy Opperman from the Department for Work and Pensions at our Manchester Road branch in Nelson recently. Mr Opperman joined fellow Conservative MP for Pendle, Andrew Stephenson, for a tour around our not-for-profit co-operative that provides ethical savings and affordable loan accounts to the local community. Mr Opperman has experience in ethical finance, as he helped to create Tynedale Community Bank, another not-for-profit bank in Northumberland which also allows people to save and borrow money, with interest at a much lower rate than many other lenders. I know first-hand that improving financial inclusion is key to helping some of the poorest and most marginalised in society. Both Mr Opperman and Mr Stephenson were interested to hear about the work Pennine have been doing with social enterprise SPE Furnishings in Burnley to offer an ethical alternative to the rent-to-own companies who charge high rates of interest on furniture and electricals. PCCU staff recently attended an event at the Palace of Westminster where Mr Opperman joined leading figures from the banking world and MPs from across the political spectrum to pledge their support for the credit union movement in UK.